CLICK on the IMAGE to the left, then click through the side arrows (use your cursor to hover over the side of the image) to see more great pics and happy quilters! Both pretty and smart, these aprons are easy to make and have a pocket and loop to hold a towel to keep it handy during cooking or while doing cement projects (see pics). METHOD: "Fuse & Use" - this is EASY! Just fuse, stitch, trim, & turn. All straight sewing, great for beginners! Quick to make! FUN to make from fat quarters and towels! Comes in a 6" x 9" pack with printed interfacing for 2 aprons! You will LOVE it! 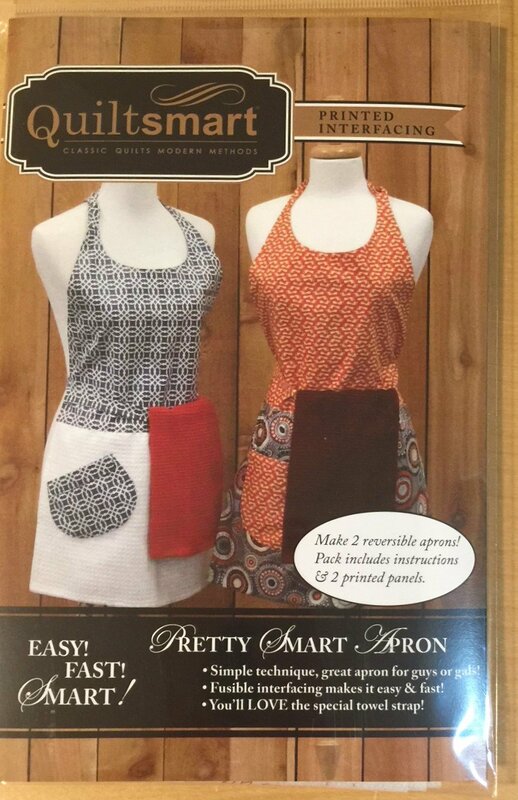 Pack includes (2) panels of Pretty Smart Apron fusible interfacing and instructions. Makes 2 REVERSIBLE aprons. VARIATIONS: The towel can be inserted directly into the bib part of the apron for a very quick and easy apron (I love this style for cooking! ).